KENNEDY SPACE CENTER, FL--After extensive troubleshooting and repairs to fix an electrical problem with the shuttle Endeavour's hydraulic power system, commander Mark Kelly and his five crewmates flew back to Florida Thursday to prepare for a delayed launch Monday on a long-awaited space station assembly mission, the orbiter's 25th and final flight. The countdown is scheduled to begin Friday morning, setting up a launch attempt at 8:56:26 a.m. EDT (GMT-4) Monday. Forecasters are predicting a 70 percent chance of good weather. 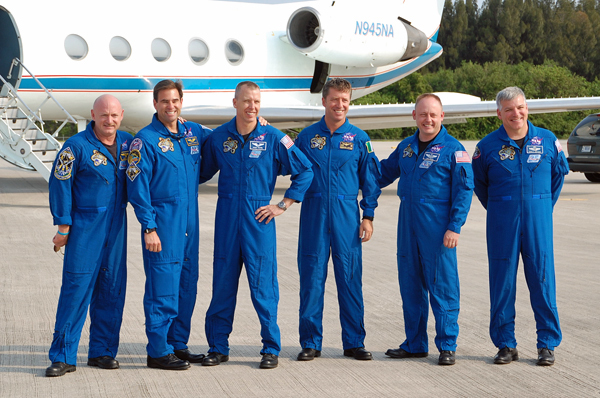 Hoping for the best, Kelly, pilot Gregory H. Johnson, Michael Fincke, Gregory Chamitoff, Andrew Feustel and European Space Agency astronaut Roberto Vittori landed at the Kennedy Space Center's shuttle runway aboard a NASA training jet shortly after 9 a.m. after a flight from Houston. "It's great to be back," Kelly told reporters. "Four days from now, we should all be strapped in and ready to go. Hopefully the weather will be good. (Launch Director) Mike Leinbach just told us the vehicle is in great condition. We really appreciate all the hard work by the team that's worked over the last couple of weeks to get shuttle Endeavour ready." Kelly said the crew's families, presumably including his wife, Arizona Rep. Gabrielle Giffords, "will be down later in the week." "All of our kids are in school and they missed a lot of school last (time) and we couldn't let that happen again," he said. "So they'll be down over the weekend, even though I'm sure they'd rather be here in Florida now." Giffords, who is recovering from a gunshot wound to the head in a January assassination attempt, flew to Florida for the crew's first launch attempt and is expected to return for the second. "I'd just like to say on behalf of all of us, we all know Mark's been through a lot the past few months," Chamitoff said Thursday. "He's done an incredible job keeping track of all the details of this mission. I flew with him on (mission) STS-124, he's truly an amazing commander and all of us feel really, really lucky to have him guide us through this complex mission." Endeavour was grounded April 29 when hydraulic system fuel line heaters failed to activate as required when the shuttle was being fueled for launch. Extensive troubleshooting revealed blown fuse elements on a power switching circuit card inside an engine compartment avionics box packed with electrical distribution gear. Engineers have been unable to find the short that caused the fuse to blow, but the box was replaced, along with thermostats and the power line between the box and the heaters. The system worked normally in a battery of tests and engineers are confident the heaters will operate as required when Endeavour is loaded with supercold propellants Monday, subjecting the hydraulic system fuel lines to low temperatures. Engineers plan to start Endeavour's countdown at 7 a.m. Friday. Liquid oxygen and hydrogen will be pumped aboard Saturday to power the ship's three electricity producing fuel cells and a protective gantry will be pulled away from the ship Sunday at noon, exposing the orbiter to view and clearing the way for fuel loading. The three-hour fueling procedure is scheduled to get underway around 11:36 p.m. Sunday. If all goes well, Kelly and his crewmates will begin strapping in at 5:41 a.m. Monday to await liftoff on the 134th shuttle mission. The primary goals of the flight are to deliver a $2 billion particle physics detector to the International Space Station, along with supplies and a pallet of critical spare parts and components. Four spacewalks are planned to carry out needed external maintenance and the shuttle crew will help their station colleagues service a U.S. carbon dioxide removal system, along with transferring supplies and experiment hardware. The launch delay has complicated the mission flight plan because of the scheduled departure of a Soyuz ferry craft May 23 carrying three space station crew members back to Earth. The station crew must adjust their sleep cycles to synch up with the re-entry schedule, which is dictated by the station's orbit and the location of the Soyuz landing zone in Kazakhstan. But the Endeavour crew will be on a different sleep cycle through undocking day because of their time of launch and landing in Florida. After the Soyuz departs, the station crew members will adjust their schedules to synch back up with the shuttle astronauts.